One of the higher hilltops in Pittsburgh rises above the Allegheny River between Heth's Run (Haight's Run) and Negley's Run (Washington Blvd). "In 1778 he (Alexander Negley) brought his five and five children to the neighborhood of Fort Pitt, and settled on a farm of about three hundred acres. A large part of that farm is now included in Highland Park. He built a log cabin and later a more substantial house, on a knoll that is now the basin of the Highland Reservoir. 'This monument marks the center of a burial ground located on the former homestead of Alexander Negley, where are interred about fifty early settlers of the East Liberty Valley.' "
The city made its first efforts in building a public water system in 1802 by authorizing a series of wells and pumps. In 1824 the first reservoir was built at the top of Grant's Hill, now the site of the County Courthouse. The water system continued to develop as the city grew, and in 1871 a major plan was begun at Negley's Run on the Allegheny River. Near the Brilliant Oil Company, which was a forerunner of the Standard Oil Company and which would give its name to the Brilliant Branch of the Pennsylvania Railroad, a pumping house was built. A new reservoir was begun on the nearby hilltop which was shared by Negley family farms and James McCully. Engineers determined that the elevation was too great to pump the water from river level to the Highland Reservoir so a lower reservoir was begun as an intermediate step. Stones were cut to line the basin of the Brilliant Reservoir, and construction was substantially complete when a pumping system was found which made the lower reservoir unnecessary. Many of the stones from the lower basin were reportedly reused in walls and bridges in the park which would soon develop. Operation of this part of the public water system began in 1879 though it took four years to resolve leaks and other faults. Edward Manning Bigelow, known as the "father of Pittsburgh's parks," was appointed City Engineer in 1880. The position was transformed in 1888 into Director of Public Works and during his tenure of over thirty years, Bigelow forged major improvements in boulevards, waterworks, and parks. He quietly began his efforts to acquire land in various parts of the city for public park use. This was at a time when only the wealthy had significantly large amounts land around their homes. The only public park was a block long area in Second Avenue between Grant and Ross streets downtown -- now the ramp of the Blvd of the Allies. The most famous story of Bigelow regards his negotiations with Mary Schenley which resulted in the rescue of Mt. Airy from residential development and the formation of Schenley Park. At the same time, he had been discreetly acquiring tracts of land, sometimes one lot at a time, at the head of Hiland Avenue. (Robert Hilands was the surveyor hired by Hon. James Ross to subdivide the Negley lands around East Liberty. The name was altered by city council to "Highland" in 1890.) Not coincidentally, parts of this land were purchased from William Flinn and James Booth who owned the most prominent contracting company in Pittsburgh. Thomas Mellon and Christoher Magee were also involved in the nearby real estate and the latter donated the original buildings of the Highland Park Zoo in 1895. All four of these men were stakeholders in the street railways which led to the new park and zoo. Though the secret deals eventually led to the ouster of Bigelow and the crumbling of the famous Pittsburgh political machine, the public works that resulted from this time period are undeniably important. Eventually the land consolidation amounted to nearly 370 acres. In September 1889, city council passed an ordinance setting aside the land around the Highland Reservoirs as a public park. Highland Reservoir Number Two was begun in 1897 and completed in 1903. The abandoned Brilliant Reservoir was converted into Carnegie Lake, a recreational facility which featured swimming, boating and fishing. Under Bigelow's direction, the rebuilding of the lake and the layout of the drives and paths of Highland Park are attributed to Wesley S. Wakefield; the original planting and reforestation the mostly barren hilltop was undertaken by William Falconer. Schenley Park was larger and covered numerous hills linked by several notable arch bridges; Highland Park, aside from the reservoirs, was much more simple from an engineering viewpoint. 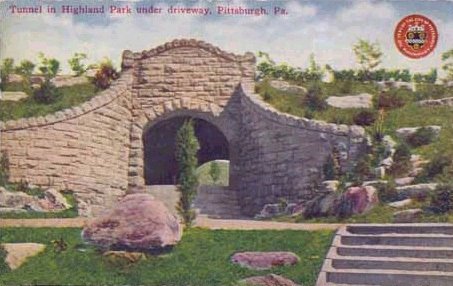 Only two, relatively small, stone arch bridges were built within the park: one on The Hill Road (now One Wild Place at the Pittsburgh Zoo) and the other near Carnegie Lake off Stanton Av. The latter is another of Pittsburgh's buried stone arch bridges similar to the bridge at St. Pierre's Ravine near the Carnegie Library entrance to Schenley Park. A third arch bridge over Heth's Run was built on Butler Street leading to the river entrance to Highland Park. This bridge, much altered and severely deteriorated, is also nearly buried. Within Highland Park, the drives and paths are all related to the Reservoirs -- encircling and connecting. The main entrance at Highland Av features a pair of monumental towers topped by allegorical statues of the Harvest. The sculptures are by Giuseppe Moretti who is also known for the panthers on the Panther Hollow Bridge in Schenley Park. To the left of this main entrance once stood the 1900 Stephen Foster statue, also by Moretti, which was so vandalized in its remote location that it was moved to its present Oakland location in 1944. A less formal entry to Highland Park is made from the intersection of The Hill Road and Lake Drive. From this point a stone stairway leads to the Negley Circle memorial grove; the path continues under Reservoir Drive through a cut stone tunnel. This Tunnel Walk was a favorite subject of postcards and appears in many reprints, the earliest of which indicates the structure was in place before 1886. The Tunnel Walk uses the same rough faced cut stone found on retaining walls in all of Pittsburgh's classic parks and throughout the city -- a signature mark of the long and productive career of E. M. Bigelow. Stewart, Howard. "Historical data, Pittsburgh public parks," 1943; Harper, Frank C. "Vol.1 Pittsburgh of today, its resources and people," 1931-1932; Boucher, John Newton. "A century and a half of Pittsburg and her people, Vol. 2", 1908; Lanpher, Erwin Eugene, "City of Pittsburgh, Pennsylvania : its water works," 1930; Gay & Evert, "Discovering Pittsburgh's Sculpture," 1983; Pittsburgh (Pa.). Citizens Committee on City Plan of Pittsburgh. "Parks : a part of the Pittsburgh plan," 1923; W.W. Thomson, "A digest of the acts of assembly relating to and the general ordinances of the city of Pittsburgh from 1804 to Jan. 1st, 1897," 1897.